At the tip of Michigan’s thumb, a few miles east of Port Austin, kayakers can view Turnip Rock, a picturesque sea stack, and Thumbnail Rock, a finger-like projection from a sandstone cliff on the mainland. While interesting to view on a calm day, these rock formations are part of a network of dangerous ledges and detached rocky spots that extend up to two-and-half-miles offshore between Pointe aux Barques Lighthouse and Port Austin Reef Lighthouse and have snagged numerous vessels. The first settler of what is now known as Port Austin was Jonathan Bird, who arrived in 1837 and built a water-powered sawmill on a creek the following year. The area was called Bird’s Creek for some time until Bird sold his mill to the lumber firm of Smith, Austin, and Dwight. In 1854, the village was renamed Dwightville, but then P.C. Austin, a partner in the lumber firm, built a boat dock and put up a pole with a light to serve as a lighthouse. The village was soon called Austin’s Dock, followed by Austin Port, and finally Port Austin. And the appropriation heretofore made for a light-house at Port Austin, Michigan, may be expended in commencing the construction of the proposed light house on the reef instead of on the shore, provided the total estimate for its completion shall not exceed eighty-five thousand dollars. The Lighthouse Board had successfully convinced Congress that an offshore lighthouse would be better, and an additional $75,000 for its construction was appropriated on March 3, 1877. An octagonal foundation crib was built at Tawas, where lumber was readily available, and on August 12, 1877, it was towed out to a prepared spot on Port Austin Reef, 1.3 miles from the nearest point of land. Once in place, additional courses were added to the top of the crib, and its interior was filled with concrete. A two-story, redbrick duplex was built for the lighthouse keepers at the site acquired in 1875 for a land-based lighthouse. 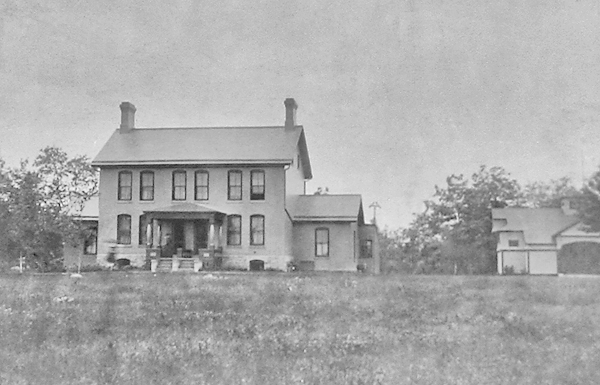 The dwelling was finished in July 1878, along with the offshore crib. The impressive crib foundation was topped by a simple, square, pyramidal, open-framework tower whose light was situated fifty-seven feet above the pier and eighty feet above the lake. A fourth-order Henry-Lepaute lens was used to produce a fixed white light for one minute followed by five red flashes, spaced by twelve seconds. The lens was made up of seven panels: two clear panels that each covered ninety degrees, and five flash panels on the opposite side of the lens, each covering thirty-six degrees. The light was displayed for the first time on the night of September 15, 1878, by Keeper Charles Kimball. Assisting Kimball were his brother Alonzo and Aaron G. Peer. The total cost for the lighthouse was $80,923. Charles Kimball grew up on his father’s farm next to Pointe Aux Barques Lighthouse, and during his childhood, he was enthralled by the interesting tales of lighthouse keepers. At the age of nineteen, Charles was appointed assistant keeper at Pointe Aux Barques, and six years later, he was made head keeper at Port Austin Reef. After five years on the reef, Kimball became head keeper of Whitefish Point Lighthouse, where he would spend twenty years, and then head keeper of Marquette Lighthouse, from where he would retire in 1925. Keeper Kimball’s lengthy career spanned more than fifty years. Two wood-frame buildings were erected on the pier in 1882 to house duplicate first-class steam sirens. Water to run the steam fog signals had to be pumped up from Lake Huron, and in 1887 a new force-pump was put in place for this purpose. In 1888, the method of supplying water to the fog signals was improved by installing a large wooden tank in each signal house and using a steam injector to pump water into it. Ten-inch steam whistles took the place of the sirens on June 30, 1894. In 1898, the foundation pier was rebuilt and work commenced on a new combination lighthouse and fog signal for which the following description appeared in the Annual Report of the Lighthouse Board of 1901. The structure consists of a square, buff-brick tower, four stories high, with a living room and kitchen. The focal plane of the light from the base of the tower is 54 feet. The tower is connected to the fog-signal building. 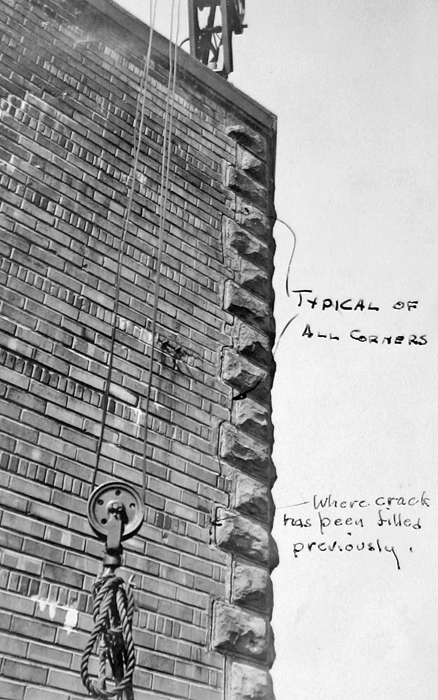 The first story of the tower and all of the fog-signal house show an inside finish of brick, and the second and third stories of the tower are plastered. The circular watch room of the tower is iron and is lined with oak ceiling. The trimmings, floors, and stairs of the, tower are of oak. The main deck, circular watch room, lantern deck and lantern are all of cast iron. The sixteen-foot-square tower also contained three bedrooms for the keepers and was topped by a cylindrical lantern room with helical astragals. The light was established in the new tower on April 12, 1900, and the structure was finished later that summer. Port Austin Reef Lighthouse was only in operation during the shipping season, which typically ran from April to December. In 1906, the keepers closed up the lighthouse on December 7 and signaled the lifesaving crew to retrieve them. The crew set off for the lighthouse but was unable to land on account of ice. While returning to the lifesaving station, ice punched a hole in the surfboat, and it was only with great difficulty that the crew safely reached shore. When conditions finally allowed the lifesaving crew to reach the lighthouse on December 11, the keepers were near starvation. The only food they had had for each of the previous three days was a single potato divided amongst them. The Great Lakes Storm of 1913 washed numerous boats ashore and sank eight ships on Lake Huron, killing 199 people. Winds reached 90 mph and stirred up mountainous thirty-five-foot waves. One of the lucky freighters that survived the storm was the 500-foot Howard M. Hannah, Jr. upbound on Lake Huron with a load of coal. When roughly mid-lake on November 9, the freighter’s helmsman noted that the forward motion of the ship had stopped. 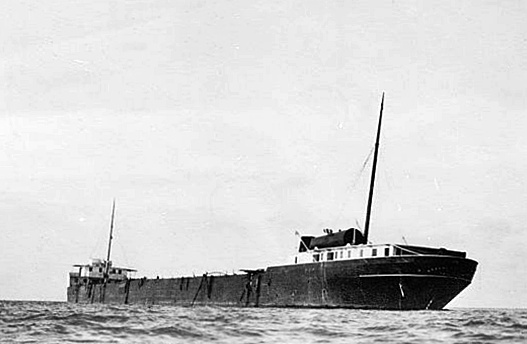 Without sufficient power to drive itself against the storm, the ship was at the mercy of the waves and was forced toward Saginaw Bay, where it grounded near Port Austin Reef Lighthouse and broke in two amidships. The ship’s crew was rescued two days later by a lifesaving crew. 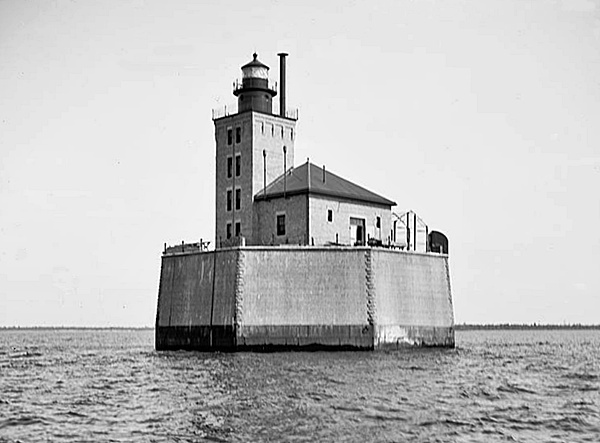 At the opening of navigation in 1915, the characteristic of Port Austin Reef Lighthouse was changed to a red flash every twelve seconds, and the intensity of the light was increased to 4,000 candlepower. 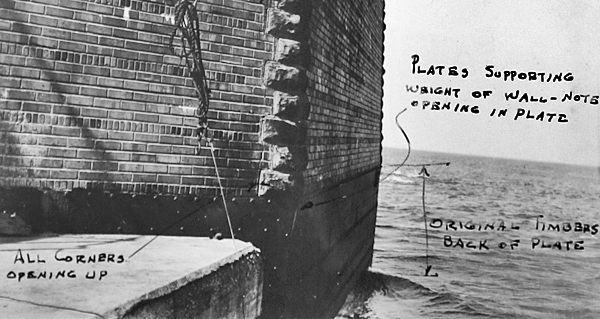 The fog signal was converted to a “Type F” air diaphone in 1933, and that year it was noted that the corners of the pier were opening up along with the metal plates at the base of the pier that were backed by the original timbers. The following year, the brick and timber facing of the octagonal pier was replaced with concrete attached to the original concrete interior with cinch anchors. Getting to the lighthouse could be problematic for its keepers. On July 30, 1896, Keeper Herbert Burrows was headed to the lighthouse in high seas when his boat, loaded with provisions, capsized, about a half mile from its destination, and sank. Through much exertion, Keeper Burrows managed to reach the lighthouse. Pointe aux Barques Lifesaving Station was signaled and succeeded in salvaging the boat and took Keeper Burrows ashore where he could receive proper care. In November 1941, Assistant Keeper Lauchling J. McDonald was en route to the lighthouse when his boat’s engine failed. McDonald was helplessly tossed about by thirty-foot waves for about five hours before he finally managed to get the engine started and return to shore. Keeper McDonald, who had been serving as an assistant keeper at Port Austin Reef since 1904, said the ordeal was the worst experience in his thirty-eight years of service. The tower’s Fresnel lens was removed in 1941, two years after an electric submarine cable had been run to the lighthouse. 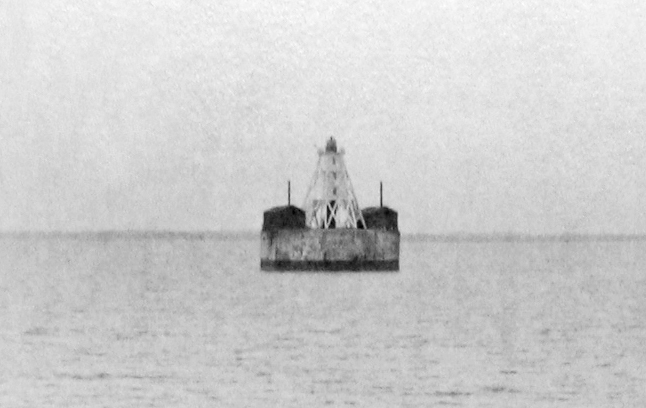 In 1942, a marker radiobeacon was established on the mainland at Port Austin to replace the fog signal on the reef, and an automatic light was placed in the lighthouse allowing the last keepers withdrawn. A modern LED light was placed in the lantern room in 2011. No longer needed, the keeper’s duplex was put up for sale by the General Services Administration and sold in June 1962 to Norman J. Dahm of Detroit for $17,010. The dwelling remains standing and is located in the private Pointe aux Barques community. 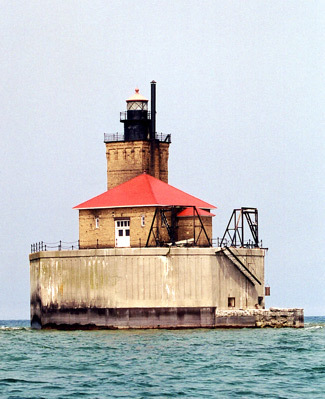 The Coast Guard decommissioned Port Austin Reef Lighthouse in 1979 and planned to dismantle it in 1984. Hearing of the Coast Guard’s plan to demolish the lighthouse, Louis Shillinger formed Port Austin Reef Light Association and obtained a five-year lease to the property in 1988. Members of the association removed three feet of guano from the lighthouse in 1990, and over the next two years placed a new roof on the structure to protect it from the elements. All windows and doors were replaced between 1993 and 1995. 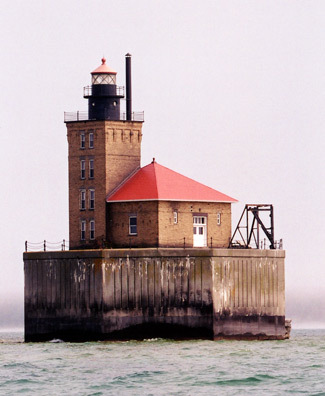 In June 2011, Port Austin Reef Lighthouse was declared excess to the needs of the United States Coast Guard and made available to eligible organizations under the provisions of the National Historic Lighthouse Preservation Act of 2000. 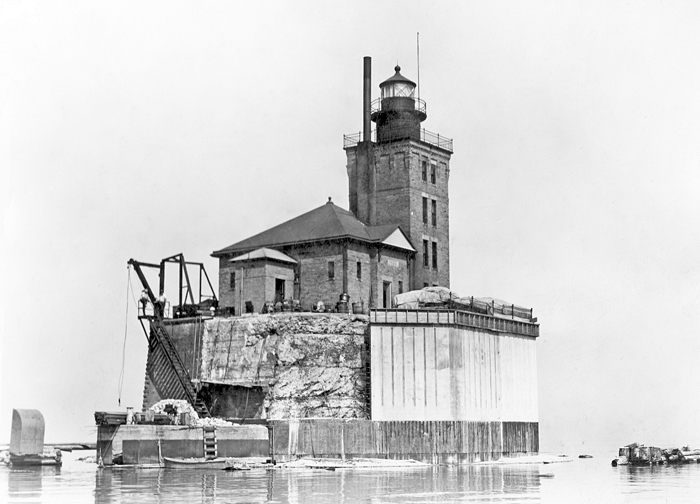 Qualified entities were given sixty days to submit a letter of interest and were required to obtain a conveyance from the State of Michigan for the bottomlands on which the lighthouse stands. 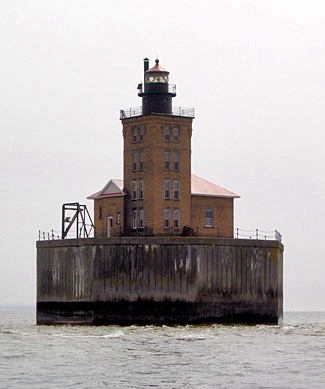 In July 2012, U.S. Secretary of the Interior Ken Salazar announced the lighthouse would be transferred to Port Austin Reef Light Association. The deed to the lighthouse passed from the Coast Guard to the association in February 2013, and a celebratory transfer ceremony was held on June 30, 2013 to honor all those who had worked so hard to preserve the “Castle in the Lake.” If you can’t make it out to the lighthouse, there is an informational display on its history at the Port Austin History Center, which opened in 2012. Head: Charles Kimball (1878 – 1883), Peter Knudsen (1883), Frank E. Kimball (1883 – 1894), Herbert N. Burrows (1894 – 1900), Daniel Carrigan (1900 – 1905), Arthur M. Carter (1905 – 1907), Otto Bufe (1907 – 1910), James Pottinger (1910 – 1921), Frank W. Marshall (1921 – 1942). First Assistant: Aaron G. Peer (1878 – 1879), Charles McDonald (1879 – 1882), Alonzo L. Kimball (1882 – 1883), Charles W. Wright (1883), Wright Ripley (1883 – 1885), Louis Fetes (1885 – 1886), George Buttars (1886), Richard O'Neill (1886 – 1888), John C. Wallace (1888 – 1889), Herbert N. Burrows (1889 – 1894), James Pottinger (1894 – 1896), Otto Redman (1896 – 1901), Herbert N. Burrows (1901 – 1903), Charles E. Ferris (1903 – 1906), Lauchling McDonald (1906 – 1942). Second Assistant: Alonzo L. Kimball (1878 – 1882), Frank E. Kimball (1882 – 1883), Charles N. Brett (1884 – 1885), Louis Fetes (1885), George Buttars (1885 – 1886), Richard O'Neill (1886), John C. Wallace (1886 – 1888), Edmund L. Cole (1888), Herbert N. Burrows (1889), William H. Trouche (1889 – 1891), James Pottinger (1891 – 1894), Otto Redman (1894 – 1896), William J. O'Neill (1896 – 1898), Charles E. Ferris (1899 – 1902), William J. O'Neil (1902 – 1903), William D. Young (1903 – 1904), Lauchling McDonald (1904 – 1906), James A. Frances (1906), Charles Richards (1906), Wilson LaPine (1906 – 1908), Edward C. Towns (1908), William Duggan (1909 – at least 1913), Edward C. Towns (at least 1915 – 1917), Albert E. Haskell (1917 – at least 1930), Daniel McDonald (at least 1939 – at least 1940). Annual Report of the Lighthouse Board, various years. Annual Report of the Commissioner of Lighthouses, various years. Annual Report of the Lake Carriers’ Association, various years. Located 2.5 miles north of Port Austin in Lake Huron. 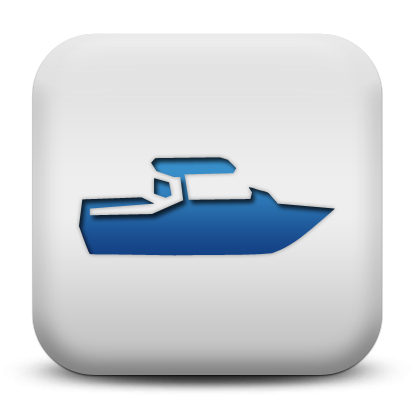 For a larger map of Port Austin Reef Lighthouse, click the lighthouse in the above map. Distant views of the light are possible from many points along the shore near Port Austin, but a boat trip out to the lighthouse makes for the best viewing. The lighthouse is being restored by Port Austin Reef Lighthouse Association. The lighthouse is owned by Port Austin Reef Lighthouse Association. Tower closed. The first time we tried to visit this lighthouse, a fall storm forced the cancellation of our boat ride, and we had to be content with a distant view from the shore. We returned to Port Austin on Memorial Day 2003, and this time we encountered dense fog. We still stopped by a marine supply store and inquired about the possibility of going out to the lighthouse. They said they would do it, but at an extra charge as it would be riskier. We decided to eat lunch first, and then see if the fog was any better. The fog was still quite thick after our meal, but we decided to try the trip. We were told that due to the fog they would need to program in several GPS route markers before we could depart. After a lengthy delay, we finally boarded the boat and headed out into the lake. By that time, the fog had lifted, and we could clearly see the lighthouse from the shore. When you get close to the lighthouse, you can see why it is named Port Austin REEF Lighthouse, as a rocky ledge extends east of the lighthouse for quite some distance. We had a pleasant boat ride (complete with an XM Radio demonstration - a first for me), and were happy to cough up the additional charge (even though there was no additional risk) for a chance to get close to the lighthouse.